Good grief. With all of the money they have to build a top sports programs you would think you would see less of this. With two Big West Conference BB teams in NCAA trouble, Northridge and Hawaii, add to that the following two D-1 teams. Especially to me…my home state University… is the the U of Minnesota again…this time in Football. EVANSVILLE, Ind. — A police affadavit alleges Morehead State’s men’s basketball coach battered two players while the team was in Evansville to face the Aces on Nov. 19. Sophomore Malik Maitland told Morehead State University Police that head coach Sean L. Woods backhanded him twice in the chest at halftime. Junior Soufiyane Diakite told MSUPD that Woods shoved him twice – once during a timeout and once at halftime. He also told police that he saw Woods strike Maitland. University police then alerted the Evansville Police Department of the allegations. 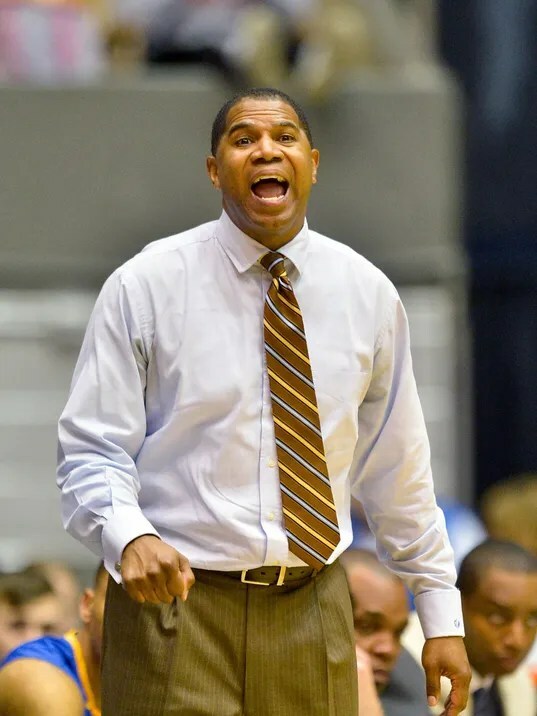 Woods, who is in his fifth season as coach at Morehead State, has been charged with battery, a class A misdemeanor. If found guilty, Woods could face up to one year in jail and fines up to $5,000. The university has suspended him with pay while they complete an internal investigation. "Resulting from complaints received, the institution has begun an investigation involving the head basketball coach. While we continue through the formal process, we believe it is prudent to suspend the coach until the investigation is finished," Morehead State director of athletics Brian Hutchinson said in a statement. Woods has been in trouble for player treatment before. During a game against his alma mater, Kentucky, in 2012, Woods made contact with a player and, according to a USA TODAY report, nearly brought point guard Devon Atkinson to tears as he screamed at him on the sideline. Woods served a one-game suspension and apologized after that incident. Woods was an IndyStar Indiana All-Star in 1988 before a standout college career under coach Rick Pitino with the Wildcats. In 2013, he was selected to be a member of the Indiana Basketball Hall of Fame’s Silver Anniversary team. MINNEAPOLIS – Minnesota has suspended 10 players indefinitely from all team activities. The school announced the suspensions on Tuesday night. Defensive backs Ray Buford, KiAnte Hardin, Dior Johnson, Antonio Shenault and Antoine Winfield Jr., running backs Carlton Djam and Kobe McCrary, quarterbacks Seth Green and Mark Williams and defensive lineman Tamarion Johnson were all suspended. The school cites "privacy restrictions relating to student educational data" in withholding further comment. The restraining order was lifted after a settlement on Nov. 2. Minnesota plays Washington State in the Holiday Bowl on Dec. 27, and it would appear to be unlikely that the players would be available to play in that game.